The Book of Monsters: Destroyer Saga continues! 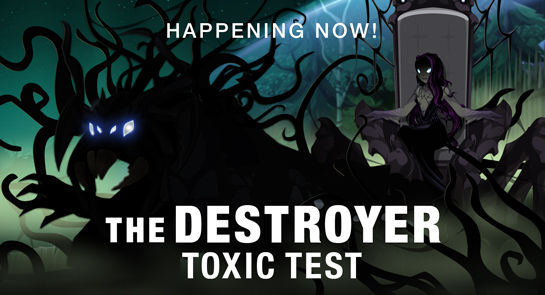 To defeat Extriki the Destroyer, Empress Gravelyn seeks information... and she needs YOU to get it for her. But take care in the questioning, Hero -- if the creature doesn't survive, we will never get the answers we need! It may be easier to win his trust and get him to cooperate. As the grannies say, "you catch more monsters with honey than you do with stabbing." /join charredpath to continue your adventure! Loremaster Maya in Battleon and Loremaster Emily in the Neverglades Battlecamp need your help to collect information about the creatures of Lore. Starting Friday, May 5th, some creatures may drop scrolls which you can turn in to get more information about them. Mad Cinco de Mayo celebrations will get underway on Friday, May 5th! To join in the fun, we're bringing back a shop full of crazy-awesome accoutrements for you to equip. Then rock out for Randor the Red's birthday as we celebrate our favorite wolf-loving wallpaper-maker! Find the Cinco de Mayo and Randor's birthday gear in the May Featured Shop. AEXtras is still a great way to get FREE ADVENTURECOINS and even FREE ARTIX POINTS so you don't miss out on these limited-time rare items! Just CLICK HERE to get started! Or, You can jump onto your Master Account and start earning free Artix Points using AExtras and use those Points to get stuff in ANY of our games!